In the White Room on NASA Kennedy Space Center's Launch Pad 39A, STS-128 Mission Specialist Jose Hernandez - a former migrant farmer from Stockton, Calif. - waits his turn to enter space shuttle Discovery during a launch rehearsal for his Aug. 25, 2009 launch. Residents of California's 10th District will decide whether or not to elect former astronaut Jose Hernandez to Congress on Tuesday (Nov. 6). Hernandez, who served NASA as an astronaut between 2004 and 2011, is hoping to make his next mark as a Democrat in the U.S. House of Representatives. The spaceflyer was born in French Camp, Calif., and spent much of his childhood doing migrant farm work with his parents, Mexican immigrants. He didn't learn English until he was 12, but soon excelled at school after his family settled in Stockton, Calif.
Hernandez finally realized his dream when he rode the space shuttle Discovery to orbit in August 2009. On that mission, called STS-128, he and six other astronauts delivered a new module filled with science equipment and supplies to the International Space Station. Hernandez retired from the space agency in 2011 and came back to find that his hometown area in California's Central Valley had been hit hard by the economic recession. Many houses had been foreclosed and the region's unemployment rate was twice the national average, he said. "And yet our folks in Congress were not doing a single thing to provide relief to our community," Hernandez told SPACE.com during a September interview, adding that when people started suggesting he run for office, he decided to "throw my hat in the ring." At first, there was some controversy about how Hernandez could describe his occupation in voting materials. California Republicans had argued that Hernandez should not be allowed to list his job as "astronaut/scientist/engineer" on the ballot, but in March California Judge Lloyd Connelly ruled that "astronaut" was Hernandez' rightful designation. If he is elected, his first priority will be improving the lot of his fellow Californians, Hernandez said. But he would also aim to advocate for NASA and space exploration. "As far as the space program, you can't get a bigger cheerleader in Congress than a former NASA astronaut who's flown on the shuttle," he said. "You can bet your mortgage that I'm going to be fighting for NASA, fighting for investment in science and technology, and fighting for investment in education, because those are the things that are going to move our country ahead in the future." 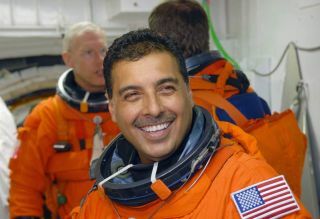 Hernandez has detailed his life so far, as well as his hopes for the future, in a memoir titled "Reaching for the Stars: The Inspiring Story of a Migrant Farmworker Turned Astronaut" (Center Street, September 2012).